The principal personality amongst Sri Gaudiya Vaisnava acaryas, Sri Sri Damodara-svarupa Gosvami, has stated that Sri Caitanyadeva is the Supreme Godhead (svayam-bhagavata-vastu) full of six opulences. This Caitanyadeva's bodily effulgence is the impersonal Brahman and the indwelling Supersoul – who eternally remains manifest as the three-fold Purusavataras, Karanarnavasayi, Garbhadakasayi, Ksirodakasayi that create the temporary universe and manifest the eternal Vaikuntha – is a partial manifestation of the opulence of Sri Caitanyadeva. Sri Svarupa Gosvami has also said that Sri Radhika is Krsna's hladini potency, the transformation of His love (pranaya-vikara). Previously, Krsna and Radhika were one and accepting two forms, they displayed Their eternal pastimes in this material world. Presently, in gaura-lila, the two separate forms of Radha and Krsna have united. With the inner mood of Sri Radhika and decorated with Her external bodily lustre, the transcendental original Godhead (svayam-rupa) Vrajendra-nanadana, with the mood of taking refuge of divine love (asraya-jatiya), has manifested His own eternal gaura-lila. Sri Rupa Gosvami has said that Sri Krsna-candra has appeared in this material world accepting the name ‘Krsna Caitanya’ in order to display His eternal form of Sri Gaura and to display the pastime of distributing krsna-prema. 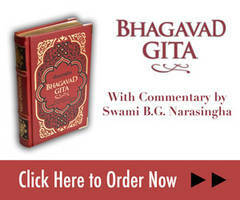 Pure devotees such as Srivasa have said that Sri Gauranga is the principal Narayana who is situated in Maha-Vaikuntha. Sri Vrndavana Dasa Thakura, Sri Locana Dasa Thakura etc. have described Him as visnu-tattva – Narayana Himself or as the Purusavataras etc. Intimate associates such as Sri Gadadhara have said that Sri Gaurhari is the very life and wealth of the residents of Vraja. Again, those devotees belonging to the school of devotion mixed with fruitive actions and speculative knowldege (karma-jnana-misra), such as Nabadasa, consider Him as non-different from the plenary portion of Narayana. The non-devotee schools of thought have not hesitated to refer to Sri Gauranga as a powerful religious preacher who was a human being. Those groups who are opposed to devotion slight Him in various ways, considering Him to be an ordinary man. Depending on one’s qualification in regards to taste and experience, one is able to perceive the characteritics of Sri Gauranga through that particular angle of vision, and in that way one defines Sri Gaura and serves Him in that mood. At present, the Mayavadis say that since Sri Gauranga is the Supreme Truth (para-tattva) then He can be seen wherever one wishes and one can say whatever one wishes about Him – there is no necessity of presenting any sectarian viewpoint, nor is there any necessity to create any kind of restrictions relating to Him. This means that a person taking liquor or ganja will consider Sri Gauranga as his intoxicant, a debauchee will consider Sri Gaura as the very ideal of debauchery, those householders attached to their homes will consider Gaura as a householder who was addicted to the pleasures of household life, a beggar will consider Gaura as as instrument for making money, politicians and social reformers will consider Gaura as a business opportunity, just as someone may use a saligrama for cracking peanuts! Whatever one follows in order to obtain a result, the Mayavadi and the pseudo-devotee have no objection to it. But Sri Gauranga has shown the significance of His name as the most magnanimous ocean of mercy (maha-vadanaya daya-nidhi) in order to frustrate Mayavada. The Mayavadi and the devotee of Gaura are, by nature, completely different subjects. The Mayavadi is egotistical, selfish, devoid of any mood of spiritual surrender and is a beggar pleading for his own prestige. A devotee is not like that. Since the Mayavadi’s attributes are pride and prestige, a Mayavadi thinks that a devotee must have those characteristics also. The Mayavadi is an impersonalist, hence he does not accept the eternal individual existence of either the devotee or the Supreme Lord. He believes that whether it be Gaura or Krsna, the Lord’s personal existence is simply a creation by Maya, therefore when Maya is annihilated, then with the absence of Maya He eternally exists only as the impersonal Brahman. It is only through the Maya of Brahman that Bhagavan and the jivas etc. attain the materially conditioned state or the liberated state in the material realm. The spiritual Vaikuntha does not exist. Basically, the Mayavadi, under the influence of his own defects such as bhrama, pramada, vipralipsa and karanapatava, does not believe in the eternal name, qualities, form and pastimes of the Supreme Lord and His devotees. Those that consider pure devotion and devotional characteristics to be momentary and perishable, those who deem them to be temporary, and who regard the eternal devotees and Supreme Lord to be equal, illusory, mortal elements are known as Mayavadis. Those that come under the influence of Mayavada are the Bauls, Nedas, Sains, Darveshas, Cudadharis, Gauranga-nagaris, as well as those devotees of Gaura who believe in Theosophy, and the attached householders who consider by their cunning intelligence that service to ‘Grhi-Gauranga’ is a convenient opportunity to attain domestic bliss and fulfillment. Furthermore, they begin to quarrel with the devotees as to why such activities cannot be considered to be gaura-bhajana. But if someone amongst them, by good fortune, attains a little pure devotion arising from within, then they can easily leave aside the materialistic conceptions of the Mayavadis. The fundamental principle of Sri Gaura is eternal and His pastimes can only be understood by His own associates who have the necessary qualifications. Due to their defects of bhrama, pramada etc, it is the Mayavadi’s dharma to pervert those pastimes and to try and make them the subject for those who are overly attached to mundane family life. That jiva who, after taking shelter of Mayavada, calls himself a gaura-bhakta like the Bauls and Sain, and neglecting hari-bhajana, eats eggs, fish and meat and starts analysing caitanya-tattva from the platform of his deluded intelligence, is eventually considered to be abominable from the spiritual standpoint and turns into an entangled householder and is known by the title of Baul etc. Similarly, if sections such as the Neda, Baul, Sain etc. leave aside their individual mental speculation and subtle misconceptions, and take to the chanting of the holy name without offences, then their offences to the Vaisnavas can be nullified and they become eligible to enter into understanding gaura-tattva. Otherwise, in an efforts to carve an idol of Gauranga, they will mistake Him to be something else. Considering oneself independent and leaving the shelter of the lotus feet of Sri Guru and the Vaisnavas is certainly a path in the wrong direction. At the time when Krsna entered the arena of Kamsa, different onlookers observed the same Krsna in different moods, but the original form of Krsna (svayam-rupa) is only visible to the eternal devotees who are under the shelter of Gopi-jana-vallabha (the lover of the Gopis of Vrndavana), who is their only object of worship. The salvationists, non-devotees and Mayavadi's endeavours for self-improvement are on the temporary platform, but the eternal endeavours of the devotee are exclusively executed as devotional service. Maya resides only where there is no krsna-bhakti. The very place where there is Maya, there will be pride. They think, “I understand so much”, “I am very expert in understanding things” etc. The false sattvika-bhava of the Mayavadi sampradaya is saturated by evil. With tears in their eyes, by sobbing, by the novel rhymes of the Sakhi-bhekis, and by loudly shouting, they perform malicious bhajana. The worship of the form of Gaura created by their imagination is certainly not the same object that is worshipped by the devotees. The Mayavadi, with his mundane vision, installs Gauranga and considers Him to be made from mundane elements, and by declaring, “My Gauranga” etc. he preaches his own concocted philosophy in the name of Gauranga. The devotee community never accepts these various sections of Mayavadis within any ishtagoshti in any way, nor do the devotees give them their association in order to try and convince them. The unfortunate Mayavadi, being deprived of the association of devotees, fails to understand the words spoken by the devotees and considers the devotee to be a babbler like himself. But who is ultimately cheated by this? The devotee, by rejecting the bad association of the Mayavadi and by dint of serving Hari, has reached the highest position. The Mayavadi, along with a few more backwards materialists, thinks that he has preached gaura-bhakti (albeit mixed with Mayavada). In reality, it is like stealing iron from a blacksmith and they are simply creating an unsubstantial, materialistic, greedy sampradaya. Comparitively, if one follows the path shown by the Rupanugas and mentally leaves the association of uselessly argumentative, atheistic Mayavadis, then hari-bhajana becomes easy. Krsna is one thing, Sri Gauranga is one thing. When one establishes Them through his imagination as something else other than they really are, one gets derailed and becomes a false devotee and a materialist. The supreme truth of Gaura has been established and written about by the Gosvamis for those devotees who are their followers. Those Mayavadis that neglect their writings, spend their time creating their own imaginative philosophies and claim that it is the siddhanta of the Gosvami sastras. They further create other abominable illusory concoctions such as ‘Grhi-Gauranga’ (Gauranga as a householder), ‘Nyasi Gauranga’ (Gauranga as a sannyasi) etc. and thus they attain no good result except for becoming afflicted by enviousness. The Mayavadis should certainly know that the supreme truth of Gaura is eternal, He is not an object belonging to the manifested world formed by Maya. Innumerable crores of Mayavadis with the weapons of their transient imaginations can try to attack Sri Gauranga, but they can never change His eternal form to gratify and please their own senses. That object which can be transformed never becomes the object of worship for the Rupanugas and it is never the Supreme Object that is Gaura. The consciousness of a jiva, drowned by the filth of Mayavada, cannot pervert Gaura's name, quality or activities in any way; but the Mayavadi who prides himself as being a follower of Gaura becomes a member of the Gauranga-nagari camp and his efforts are similar to those of Ravana capturing Maya-Sita. The transcendental subject matter of Gaura is something that can never be accepted by Mayavadis. But it also an eternal truth that Mayavadis will never be able to conceal Gaura and pure devotion. For the last four hundred years, Mayavadis have tried in various ways to force Gaura to enter their own illusory domains, and at the same time Sri Gaura Bhagavan is also sending His own pure devotees to the material world in order to frustrate the endeavours of the Mayavadis. There is an eternal struggle between the non-eternal Mayavadis and Gaura. The result of this war is the rise of pure krsna-prema in the uncontaminated land that is the heart of the jiva, or the swelling of Mayavada poison in the impure soil of the jiva’s cosnciousness. Instead we suggest that one should give up the mentality of a termite and with a sincere heart read the Bhakti-rasamrta-sindhu and the Sri Caitanya-caritamrta. In that way, one will realise the eternal purpose of life and one will understand who is Sri Gaura and who are His intimate associates. And if one rejects this, and declares that opportunistic grha-vrata-dharma is actually trancendental gaura-bhakti, then the end result will be that the eternal pure devotees will renounce your association, considering you to be a Mayavadi who is merely deceiving his own self. Mayavadis continuously state that they cannot understand the words of pure devotees. They go against tradition and, mixing everything up, they establish that perceiving sweet and bitter, dishonesty and honesty, idleness and enthusiasm, getting beaten and getting sweets are all the same thing and this is the gaura-bhakti found in this sinful world. Only the mouth of a Mayavadi can make such ‘beautiful’ statements about gaura-bhakti! The Mayavadi wants to understand everything through his meagre material intelligence. He thinks that he will understand Gaura and gaura-bhakti through his enjoyment-seeking material intelligence and then he will become a preacher of a materialistic religion. If one's behaviour is not permeated with a serving temperament, one cannot preach. Your conduct shows a strong tendency towards exploiting maya and this tendency remains firmly within your heart, yet it is proclaimed that the great ship of devotion has already reached the port of your mouth! “Initially I will not perform any bhajana. I’m not willing to leave the five places that Pariksit Maharaja told Kali to exert his influence over. The world considers me as a real Griha-Baul. They call me a devotee, they call me a philosopher and I am puffed up with the ego of a fame-seeking Mayavadi. In this world I am well-versed in the ritual of the grhamedhi-yajna (sacrifce to achieve home comforts)” – this is an unhealthy desire for one who wishes to be known as a devotee of Gaura. If one analyses this subject, then the investigator should not be prejudiced by Mayavadi ideas – rather, one must certainly have a service-inclination towards it. Just as a Kazi, because he belongs to a different religion, is incapable of deciding the dates of Hindu festivals due to his lack of knowledge in shastra, just as a barren woman is incapable of giving birth to a son, just as one cannot eat sweets with his eyes, similarly being under the influence of mundane faith and unknowingly accepting the essence of Mayavada, it is futile to try to understand spiritual subject matters concerning Gaura. Try to understand that your very existence is to be totally subservient to the Rupanugas, who are pure devotees of Gaura – then you will see that all the darkness and fog of illusion has vanished like a momentary storm and the eyes of divine love have blossomed. Rejecting this advice, one may go to heaven or to hell, but you will only learn enmity towards the Vaisnavas and will be cast far away from Sri Gauranga. 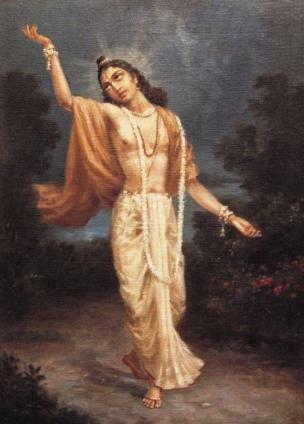 Once one is fixed in understanding the nature of Gaura, then his heart will be touched by all these things and he will be inspired to know where the transcendental abode is and one can determine whose abode it is; one will believe the words of the pure devotees and understand what the atheistic Mayavadis say about Gaura. If one continues performing frivilous activities like the professional Grhi-Baul Sahajiyas, whimsically wandering here and there in this material world, then the pride and stone-heartedness that arises out of the material bodies of common men will shut the already closed eyes of the Mayavadi for a second time! Bauls ­– An apasampradaya that claim to be followers of Sri Caitanya. They are minstrels that sing concocted songs about Krsna and mix Vaisnavism with Islam. There are two types of Baul – the Bairagi-Baul (renunciant) and the Grhi-Baul (householder). Bhrama, pramada, vipralipsa and karanapatava – The four human defects of making mistakes, being in illusion, cheating and having flawed senses. Cudadharis – A groups of so-called devotees who dress as Krsna and try to imitate His pastimes with the gopis. Darveshas – A cult that mixes Vaisnavism with Sufi mysticism. Gauranga-nagaris – A Bengali cult that reject the position of Lord Caitanya as the universal teacher, accepting Him as one the enjoyer of the company of women in Nadiya. Grhi-Baul – a Baul who is a householder. Grhi-Gauranga – The worship of Mahaprabhu as a grhastha by attached householders. Grhavrata-dharma – The selfish activities of attached householders. Nedas – A cult that mixes Vaisnavism with Buddhism and is ultimately impersonal. Sains – A so-called renunciant that follows no rules. Theosophy – A impersonal doctrine concocted by Madame Blavatsky in 1875. Sakhi-bhekis – An unauthorised cult whose male members dress up as gopis, hoping to attract the transcendental senses of Krsna. Sahajiya – A so-called follower of Lord Caitanya who is imitates the high feelings of divine love felt by real devotees.